Open Notepad++, click Search -> Find in files… . 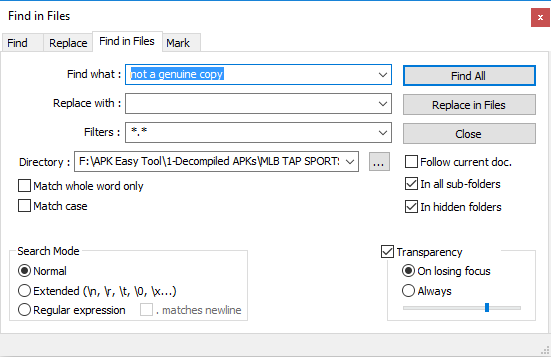 Select the directory to search and search "not a genuine copy"
Replace const/4 v4, 0x0 with 0x1 so it returns true. The game will pass the signature check and let you play. My next step is to bypass server-sided signature check that makes the game stuck in loading screen, yep another fake bug that I will look into it. 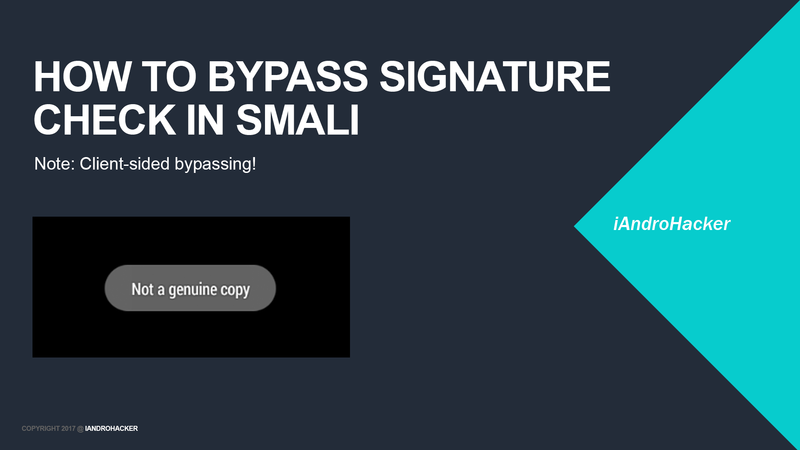 About bypassing server-sided signature check, it required you to spoof signature hash by putting original hash in smali or keep original signature (we call it unsigned). The server needs at least one original signature hash that matches the server-sided signature hash to let you play. Giving the server wrong signature hash, such as, blank string, hash from testkeys, "null", "don't ban me please", etc won't let you play the game online.